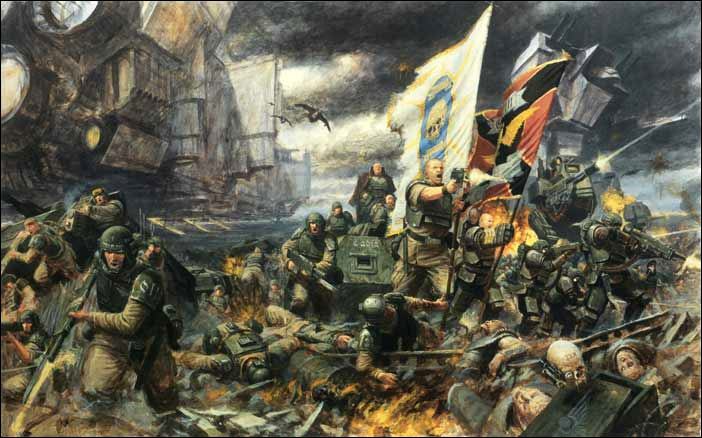 This is the first in a series of articles taking a long, hard look at how the Imperial Guard Codex stacks up in the 6th Edition of the rules. There will be more focus on what has changed than what has stayed the same, so I plan to do in-depth look at the transformed Primaris Psyker and the Valkyrie/Vendetta as flyers, and then end with ally options. A lot of this will be based on my own opinions and experience, so I will be viewing the units and options through the lens of someone who wants to use Guard on the top tables at tournaments. That means my tilt is going to be towards the options I feel give the most bang for your buck in a 'Take All Comers' list, so it is to be expected that some reader’s opinions on some of the units will differ. “Your Mileage May Vary“, but I will do my best to highlight the pieces of the imperial puzzle that I think fit together best and give the lowly humans of the grim dark future the best possible chance of success against their implacable enemies. Who are generally Space Marines. Go figure. Great in 5th edition, and now better than ever in the 6th. I’ve spoken to several people who want to ally Guard into their armies, and start with a Primaris Psyker (OMG a 70pts Mastery Level 1! ), so let’s try change the way people look at the CCS. 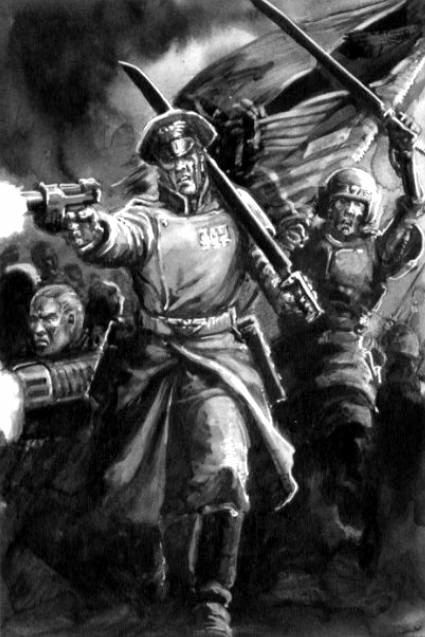 Think of the Company Commander himself as a form of Psyker who can cast 2 Blessings in the Shoot Phase on an imperial guard infantry unit using the target’s Leadership, with immunity to perils, hoods, runes and shadow in the warp. These blessings are Bring it down (fortune-style reroll misses vs vehicles and monstrous creatures), Fire on my Target (doom-style reroll successful cover saves), First Rank Fire Second Rank Fire (extra shot for all lasguns in a unit), Incoming (like a ‘blessing’ that grants a +2 cover save at the cost of being pinned), Get Back in the Fight (instant regroup regardless of all other factors, including being pinned) and Move Move Move (roll 3 dice, pick the highest when running). Those ‘psychic powers’-lite are called Orders, and it has been a constant source of amazement how many people forget to use them or ignore their existence. Drill yourself to think of the game as Movement Phase, Orders Phase, Shoot Phase, Assault Phase. The rules above should help show why the CSS provides strong competition for the Primaris Psyker, even before we look the weapon and equipment options available. You are more likely to have infantry in the open to receive orders. Whether you plan to or not, lol. You are more likely to have reserves, with Flyers being forced to start there, and the CCS is the only place you can buy a vital Astropath. You are more likely to use Plasma weapons as the game shifts towards 2+ saves and glancing tanks to death, and the ‘Bring it Down’ order can not just improve accuracy but also reduce cooking accidents. The accuracy bonus of using 'Bring it Down' almost doubles the damage output of heavy weapons not only against flyers but also when moving and snapfiring. The CCS itself is a fantastic place to put special weapons, most of which have improved in a game with hull points and lower cover saves. The CCS’s transport is less likely to be stunned and they are more likely to be able to fire from it. The Commander is not independent, so only gets the standard 4+ roll against wounds. The Commander's 'Get Back in the Fight' order is still excellent, but now that all armies can regroup within 6" of an enemy or when under half strenght it is no longer Miraculous. The CCS can’t charge out of a vehicle, making the 15pt Powerfist ‘Mop Up Squad’ less viable. Never mind, you shouldn’t have been in combat anyway. This is where the CCS really shines, with all members possessing Ballistic Skill 4 and the ability to take a heavy and up to 4 special weapons, plus a plasma pistol or two on the Commander. While they can take flamers and a even heavy flamer, the BS4 makes plasma or melta the most appealing choices. Heavy Weapons are generally left out because the squad often needs to be mobile, but a BS4 autocannon for 10pts or Lascannon for 20 certainly has appeal. The CSS can take a dedicated transport that allows your squad to fire 5 weapons from the hatch and issue orders to infantry outside it. 55pts with two heavy weapons. Bargain! Expect to see the Multilaser / Heavy Flamer version remain most popular, but some increase in ML/HB usage. One way or another, Chimeras demand your attention. For more, I covered them in detail here How Chimeras work in 6th. An alternative is to load them into a Vendetta, but with Flyers starting in reserve and no alpha strike scout-rush possible I much prefer to have the Commander on the table for turn one. Astropath for 30pts – If you intend to take more than one Flyer you should take an Astropath. Granting plus 1 to reserves (2+ on turn 2) and a reroll of the board edge for outflanking is fantastic in a game than now forces flyers to start off the table, and is also a great precaution against enemy interference. In my very second 6th Edition tournament game I had a double negative bonus to my reserve rolls as the enemy had both an Officer of the Fleet plus a ‘Divide and Conquer’ Warlord trait. My Astropath made reserves come in on an acceptable 4+ instead of a disastrous 5+ and cemented him into my list permanently. Officer of the Fleet for 30pts – Opponents are more likely to have reserves than in the past, and abilities to both slow them down with a -1 to their roll and force them to reroll board edge are appealing. However, if the enemy reserves are flyers you may want them on the table early so you have a chance to shoot them down with your own aircraft, and outflanking enemies have become less threatening now they can’t charge on arrival. The OotF will work in some lists, but I would almost always go for an Astropath first and then seriously think about whether I want this character or three more meltaguns. Bodyguard for 15pts – Stealth-nerf Alert! Previously the bodyguard rule was "Each time the CCS is wounded, up to two wounds allocated to the Commander are instead resolved against the Bodyguard", which was very useful in stacking multiple wounds (including instant deaths) onto one lucky volunteer. The new FAQ has changed this to "Whilst a Bodyguard is alive the owning player automatically passes their Look Out Sir! rolls for this unit, but any wounding hits diverted in this fashion must be allocated to the bodyguard." Not only is this merely an automatic pass for a rule that every IC and Character in the game now has, it also has to be used first, giving the opponent a chance to waste your bodyguard with bolters before hitting the Commander with S6+ weapons. At 15pts per T3 wound (that's grey hunter money), bodyguards have become a luxury few armies can afford and even less armies need. Master of Ordnance for 30pts – Ever wonder why a Strength 9 AP3 ordnance Barrage for 30pts has never been popular in Guard armies? Firstly it is inaccurate, scattering 2D6 on a hit and 3D6 on an arrow, and perhaps more importantly it requires the MoO to have remained still in his previous movement phase which reduces the value of the squad as a whole. However, this is one of the most improved advisors for two reasons: The blast now hits vehicles at full strength even if the centre is not over them, both making up a lot of ground in the accuracy and giving you the chance to hit several targets, and secondly the new rules mean the MoO counts as stationary even if the rest of the squad moves. 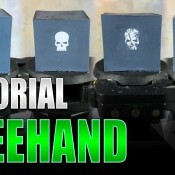 Combine that with the ‘Bring it Down’ order to increase accuracy by using a re-roll and to my surprise I would actually recommend this in some Foot-based builds. Also worth remembering (because I have seen Guard players forget!) the MoO has a rule that specifically says if he has Line of Sight you reduce the scatter by his ballistic skill (IG pg 31), and that his BS is 4, not 3. It's basic stuff but important. If you take one, don’t do anything fancy. Just aim for the centre of the enemy formation and cross your fingers. Medic – Pay 30pts, lose a space for a weapon. FNP is less useful than before (5+ instead of 4+) and in a T3 squad you do not gain the benefit of it now working against plasma – even a multilaser is instant death. It may have use in a larger combat squad with Straken, but before you buy one always remember that 30pts is the same premium a T5 Nob Biker squad pays for Feel No Pain. You are being robbed. Bodyguards - The ability to reallocate wounds is no longer unique, and the bodyguard has been FAQed to be significantly worse than under the old rules. Carapace Armour -20pts on a small squad, replaces a 5+ save with 4+. Vox-caster – you lose a space for a weapon, and the squads that would most benefit from taking a vox-caster to receive orders (heavy weapon teams) cannot have them. Dual-wielding plasma pistols – It looks cool cinematic, but costs 20pts. It also seems that killing the commander for a warlord point should be your opponent’s job rather than your wargear’s. Unless "The Tale of Captain No-hands' is your idea of forging a narrative. Even with the changes to the Primaris Psyker, the Company Command Squad remains my top HQ recommendation for anyone playing Guard. It can be heavily armed, can buy its own armed transport -and fire 5 guns from it- and comes with utility abilities that boost reserves and make it act like a poor-man’s Psyker. A Company Commander may well be weaker than most armies’ Warlord choices, but they have to get through his squad and transport first. Don’t overspend and you will find a Company Command Squad to be worth a 10/10 rating. Don't miss the Next Episode: Primaris Psyker as an HQ. Whether you love to play IG, are shopping for Allies or just enjoy killing them, there will be something for you in the IG Codex Review.